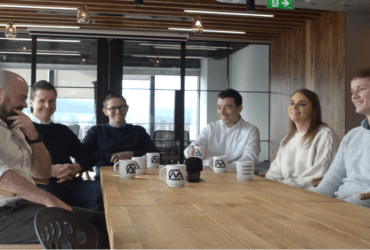 Autodesk; a company whose products have helped design some of Ireland’s most iconic structures, from the Samuel Beckett Bridge to the Guinness Storehouse, reached out to mac to fit out their new headquarters at 1 Windmill Lane. According to client services director and Dublin site leader at Autodesk, Martin Gurren, the location in Ireland’s capital was a vital element of the company’s global strategy. They wanted to create a space where their design-focused workers could be creatively inspired by the culture of Dublin, as the customers they attract tend to be intrigued by the city’s authentic style. mac took on this challenge of creating the atmosphere of the country’s capital within the walls of 1 Windmill Lane by literally taking elements from the streets of Dublin and incorporating them into the new design. More details on the spec of this project can be found here. One of the most striking features of the Autodesk headquarters is the Georgian doors which can be spotted around the office. The pop of colour and the large fanned windows of these iconic doors really stand out and make it unique to any other office in Dublin. Many Dublin headquarters have these doors outside of their offices; not many can say they have them within their buildings! The client also wished to create a positive environment for their workers. This was achieved by creating a large open space with seating areas and kitchen facilities, whilst sticking to the ‘Industrial Dockland’ theme. 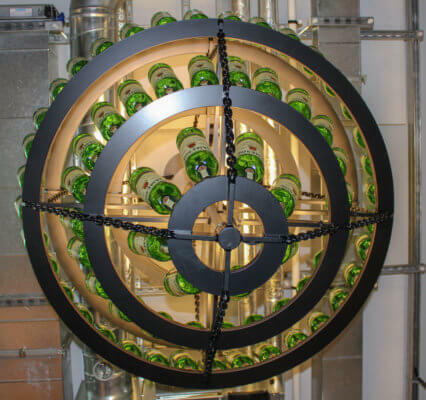 The mac team also fitted out the office space with a bar and games room. 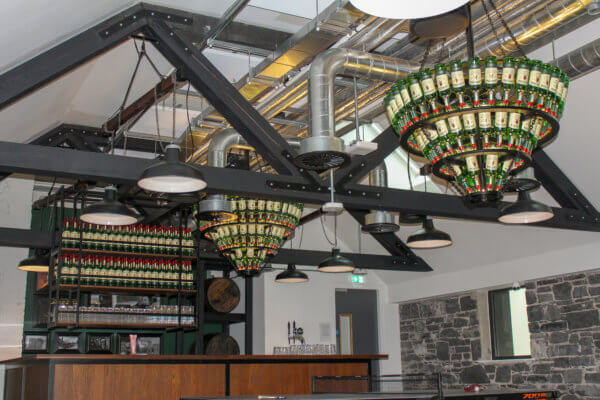 This room includes facilities such as table tennis, air hockey and games consoles, and contains impressive chandeliers constructed from bottles of Jameson Irish Whiskey. 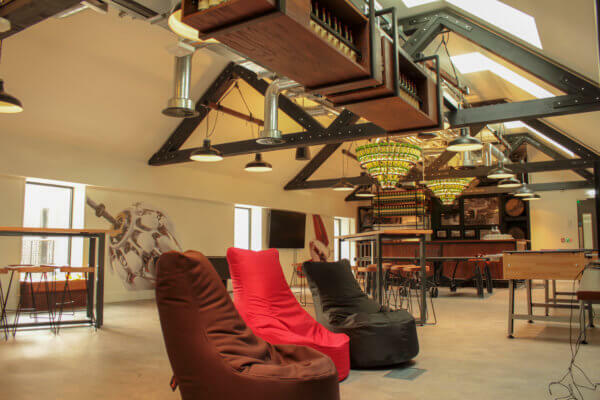 This room allows employees to enjoy some leisure time whilst also appreciating the many elements of the room inspired by Jameson Distillery Bar, and the features taken from The Trinity Library. In addition to this, workers can also appreciate the views of the neighbouring tourist attraction, the Dublin Docklands. All in all, this is a space like no other. 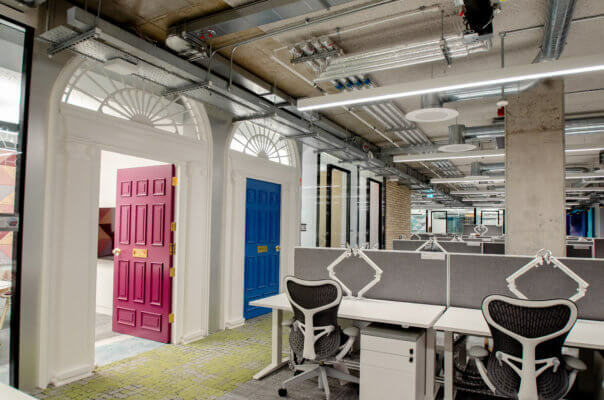 The client’s goal was to create a dynamic, technologically advanced, collaborative working environment inspired by the history of the Dublin Docklands. mac-group succeeded in delivering this theme of picturesque ‘Postcard’ Dublin by achieving the highest standards of quality and finish – a tribute to the artistic history of 1 Windmill Lane. 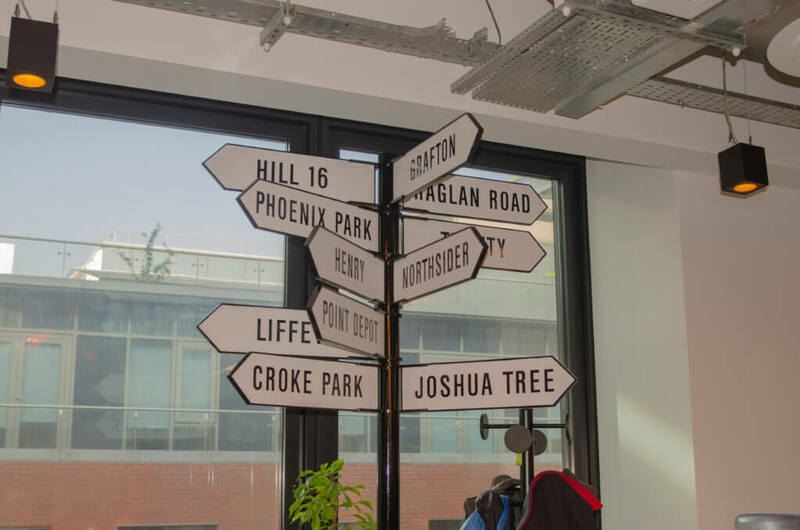 Elements of this style is seen throughout the office from the locally inspired graffitied walls, to the architectural aspects taken from old Irish pubs and famous landmarks, such as the River Liffey and the Ha’Penny Bridge. 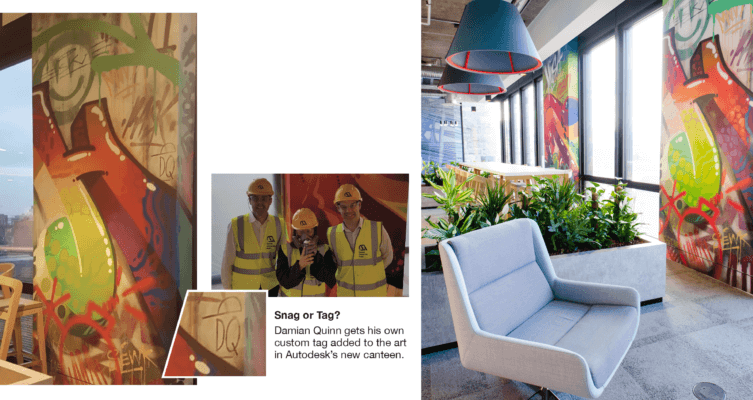 The Autodesk team were so impressed with mac Site Manager Damien Quinn that his name has been immortalised forever in the graffiti art! This space works effectively as both a museum for the best of Dublin and an impressive office space with an array of workspaces, meeting rooms, media suites, phone booths and open plan stations. Overall, mac-group have created a space that is not only aesthetically striking, but is fit with everything an office could hope for and more. "The EMEA HQ has set a new bar for how our offices world-wide should look & feel.”John Bennett – Autodesk AEC Manager Ireland.